Take Central Expressway (75) South to Richardson and take exit #26. Stay in the two left lanes to make a left turn on to E. Campbell Rd. Turn left and go 4 ½ blocks to N. Glenville Dr. The office complex is on the Southeast corner of E. Campbill Rd. and N. Glenville Dr. Suite #200 (Prometheus) is on the Northeast corner of the office building. 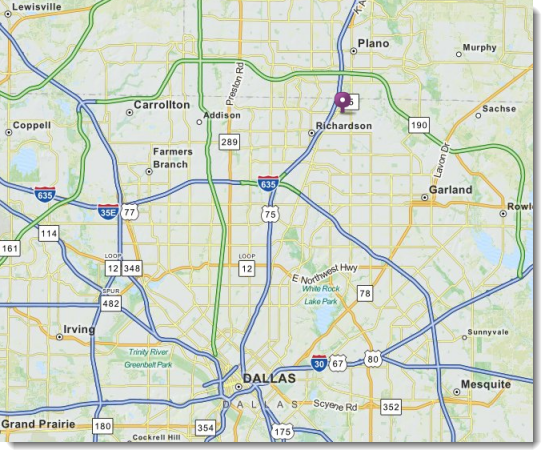 Take the Dallas North Tollway South to the the President George Bush Turnpike (PGBT). Go East on the PGBT about 5 ½ miles to Central Expressway (75). Take the South exit and go approximately 1 ½ miles. Take exit #26 on Central Expressway (South) and stay in the two left lanes to make a left turn on to E. Campbell Rd. Turn left and go 4 ½ blocks to N. Glenville Dr. The office complex is on the Southeast corner of E. Campbill Rd. and N. Glenville Dr. Suite #200 (Prometheus) is on the Northeast corner of the office building. Take the President George Bush Turnpike (PGBT) West to Central Expressway (I75). Take the South exit and go approximately 1 ½ miles. Take exit #26 on Central Expressway (South) and stay in the two left lanes to make a left turn on to E. Campbell Rd. Turn left and go 4 ½ blocks to N. Glenville Dr. The office complex is on the Southeast corner of E. Campbill Rd. and N. Glenville Dr. Suite #200 (Prometheus) is on the Northeast corner of the office building. Take either I45 North or take I35E North to East RL Thorton Freeway and get on Central Expressway (75). Go North on Central Expressway, past Northwest Highway (Loop 12). Continue another 6 ½ miles, past the I635 loop and North to Richardson. Take exit number #26 on Central Expressway (North) and follow the service road to Campbell Rd., remaining in the right lane. Turn right and go 4 ½ blocks to N. Glenville Dr. The office complex is on the Southeast corner of E. Campbill Rd. and N. Glenville Dr. Suite #200 (Prometheus) is on the Northeast corner of the office building. Take Loop 12 (Northwest Highway) to Central Expressway (75). Go North on Central Expressway (75). Continue 6 ½ miles, past the I635 loop and North to Richardson. Take exit number #26 on Central Expressway (North) and follow the service road to Campbell Rd., remaining in the right lane. Turn right and go 4 ½ blocks to N. Glenville Dr. The office complex is on the Southeast corner of E. Campbill Rd. and N. Glenville Dr. Suite #200 (Prometheus) is on the Northeast corner of the office building. Use the DART rail Red line to travel to the Galatyn Park station. The Prometheus Academy is 7 blocks from the DART Red line (Map, Travel Times, and Red Line Schedule). It takes approximately 15-20 minutes to walk to or from the Galatyn Train Station to Prometheus. It is a safe walk of a little over a mile, with only one area that does not have a sidewalk. CAUTION:The light at the E. Campbell Rd. and N. Glenville Dr. crossing intersection is very brief, giving only enough time to get halfway across. This might be fixed by fall—they were working on the crossing mechanism. People crossing E. Campbell Rd. from the station to the school should be on the east side of N. Glenville Dr. when they start and begin walking as soon as the green LEFT TURN ARROW displays, rather than waiting for the green light. By the time they get to the median, it will turn green and give just enough time to cross. Exit train and walk through the Galatyn Plaza towards the fountain and Eisemann Center. 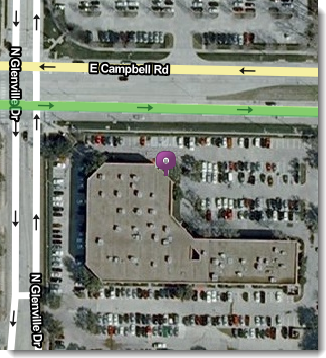 Turn right on N. Glenville Dr.
Once you reach Campbell, the school is on the right across the street. 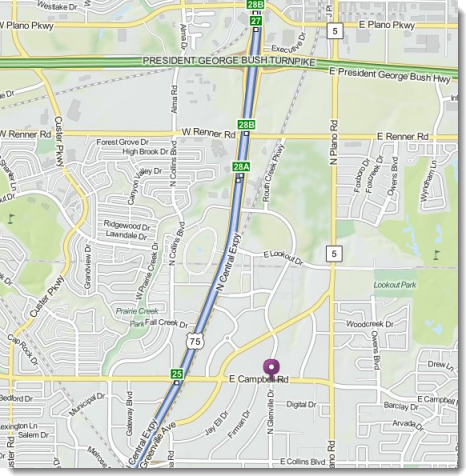 Bus #360 route map: The stop ID# for the bus stop on E. Campbell Rd, just in front of the school, is ID#20854, which people can use on the DART website to plan a trip itinerary. Use bus #360. This is a viable option for leaving Prometheus to go back to the train— it connects with the Arapaho, Spring Valley, LBJ, and Forest Lane stations for both red and the orange lines. For now, if taking the bus to Prometheus, it is also bus #360, but it lets off about ¼ mile from Promethus, on N. Greenville Ave. and N. Glenville Dr. This is stop ID#32109. Directions from that stop to the school are to walk to the N. Greenville Ave. / N. Glenville Dr. intersection and turn right on Glenville. Again, once you reach E. Campbell Rd., the school is on the right across the street. This is about an 8 minute walk. Same instructions on crossing the street.